In one tragic night, high school tennis star Ezra Faulkner’s life is turned inside-out, when a car crash shatters his knee and destroys his athletic dreams. Now, as he enters his senior year, he’s forced to reinvent himself. His girlfriend broke up with him, his friends drifted away while he was recovering from the accident, and he’s lost his place in the school hierarchy. With no one expecting anything of him anymore, what’s he to do with himself? First, he reconnects with his former best friend Toby Elliot, whose own fall from grace (involving a Disneyland ride and a tourist’s unexpectedly severed head) occurred years ago. Toby, captain of the school debate team, tries to lure Ezra into competing. Second, he meets Cassidy Thorpe, a newcomer to the school. She’s smart, attractive, quirky, independent, and fascinating. She’s also mercurial, capricious, and hiding some dark secret deep in her heart. Still, the chemistry between Cassidy and Ezra is almost instantaneous, undeniable, and irresistible. They become fast friends, which evolves into something more over time, as they go on unconventional dates (flash mobs, auditing college courses, midnight picnics) and help each other as part of the debate team. But it turns out that Cassidy used to be a debate team superstar for another school…until she unexpectedly retired, and she’s none too eager to get back on the competition circuit. The closer they get, the happier they are, the more Ezra sheds his former golden boy status for something closer to his true nature, the more he wants to understand why Cassidy keeps pushing him away at random moments. But can their relationship survive the revelations that eventually come out? And will Ezra succumb to temptation when his girlfriend Charlotte tries to lure him back into a social life of parties and privilege? In this emotionally rich teen drama, Schneider utterly turns the “manic pixie dream girl” trope on its side. Cassidy may fit the bill with her carefree ways, unpredictable behavior, convention-defying manner, and apparent goal of teaching Ezra how to overcome the past and be himself, but some of the revelations, the twists, the complex depths shown along the way, undermine and overturn expectations. Moreover, while Ezra does find new companionship amongst the debate team, it’s not automatically the noble group of quirky yet sympathetic outcasts and underdogs who teach him how to be a better person. Some are cool in their own way, some are still losers in their own way, and some are douchebags who like to argue, and there’s no reason why they all need to be friends. A refreshingly realistic take on group dynamics. 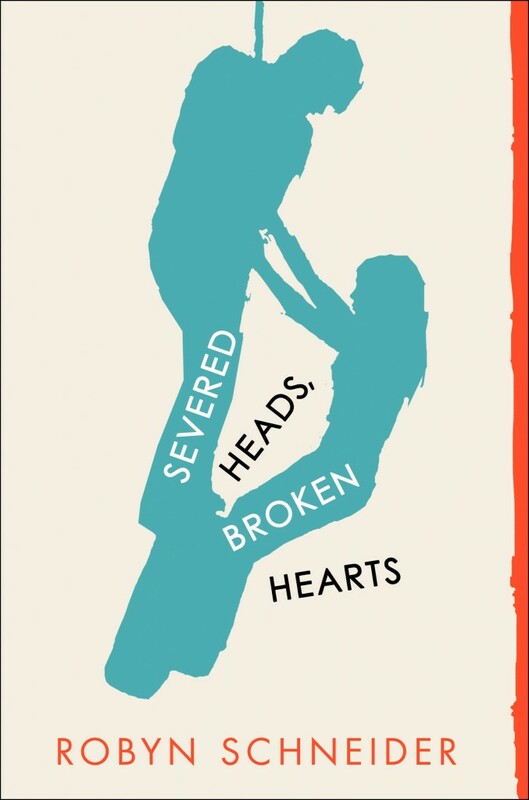 Severed Heads, Broken Hearts, may suffer from a bizarre, even disconcerting title, but its contents are as sincere, authentic, and enjoyable as any you’ll find in the YA field. I really was blown away by the skillful manner in which Schneider plays with predictable characters and tropes, before yanking the rug out from under us. It’s a little bit heartbreaking, a whole lot uplifting, and has just the right blend of realism and positivity. There’s also a great subplot regarding one character’s sexuality, where the result, never in question, is one of slightly amused acceptance. Again, the sort of thing one really likes to see. I was particularly struck by this quote: “I’m not gay. I mean, I think I am, but I’ll figure it out in college. You have to really know to be out in high school.” Schneider shows that she gets how hard it can be to find oneself in high school, no matter how sure you might be at the time. Bottom line: a book I loved, and I can’t wait to see what the author has planned next.